Indians Baseball Cards: The Bubbleopes are Coming! The Bubbleopes are Coming! The Bubbleopes are Coming! The Bubbleopes are Coming! I have loaded all the Allen and Ginter's Group Break results into bubble envelopes. The Cabinet Card, though, will be shipped in a document mailer. Everything will ship on Monday! So, hopefully by the end of this coming week, participants will have their goodies! Thanks to everyone that played along! I am putting together another group break soon! 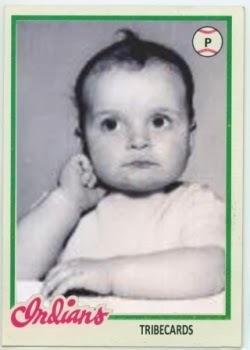 I dunno why I decided to make a 1978-based Topps card of when I was a baby roughly 10 years before the design. I thought about doing a '69 Topps version but they are none too exciting. Granted, the design above might not be all flash and flair but it is more than just block text and a circle... Google it. You'll see.